Part of my sweet pregnancy cravings have been marshmallows, so inspired by my sweet goodies, here are some ideas to feature marshmallows at your next party. The favorite of many at the campsite, s’mores. 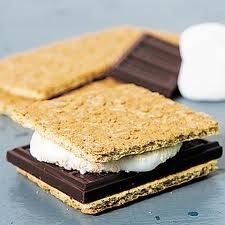 Chocolate and roasted marshmallow sandwiched between two graham crackers. 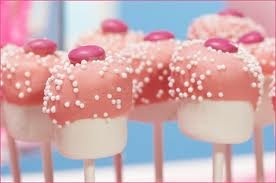 Marshmallow lollipops, dipped in strawberry glaze. 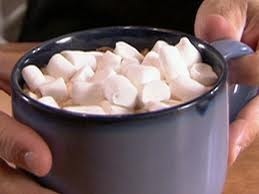 Another of my favorites, mini marshmallows over hot chocolate. 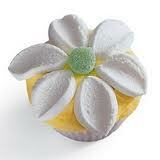 Marshmallow slices as cupcake decoration. 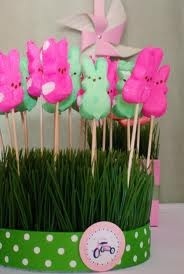 Peeps marshmallow bunnies on lollipop sticks are inserted on a base of wheatgrass to make a spring centerpiece. 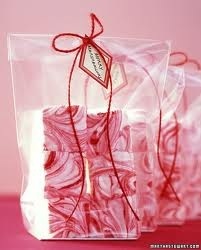 Marbled hand made marshmallows are presented on cellophane bags as favors. 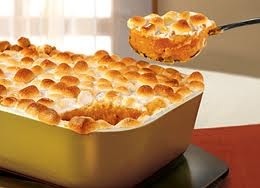 Roasted marshmallows atop a very loved side dish: mashed sweet potato casserole. 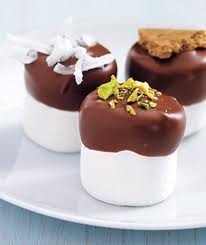 Marshmallows dipped in chocolate with toppings such as coconut shavings, pistachio or cookies, serve as sweet appetizers. Posted on July 30, 2011 February 15, 2012 by maraoudenesPosted in food idea, party ideaTagged marshmallow bunnies, mini marshmallows, pregnancy cravings, spring centerpiece, sweet potato casserole marshmallows.